ATTENTION: This list is from October 2011. For an updated list please check here, my LOCAL page, or my LOCAL Facebook Page. Thank you. Hayrides to the Pumpkin Patch (does not include price of pumpkin), Visit the Farm Animals, Run and Jump in the Hay Maze. Visit our snack bar for lunch or dinner. Visit our retail store to decorate your home, office, or classroom. You can take the hayride up on the hill to get a full view of the “harvest” valley, take a walk through the great pumpkin patch, and much more! Pick-Your-Own Pumpkin, Hayrides, Cornstalk Maze, Farm Animals, Concession Stand, Straw Tunnel, Fall Decorations, Fresh Baked Pies, Face Painting, Pumpkin Patch Special Weekend Features, Live Folk Music, Straw Treasure, Pumpkin Bowling, Pumpkin Basketball. Try the hot apple cider! Saturdays and Sundays Pony Rides, Pumpkin Picking, Pumpkin Painting, Face Painting, Refreshments, Musical Entertainment, Fall Decorations, Hayrides to the pumpkin patch, Scenic Hayrides through the woods. Saturday, October 1st MUSIC MAKERS: Local aspiring musicians will be sharing their talent for your pleasure. The farm is alive with the sound of music. Saturday, October 8th – Monday, October 10th LEGACY EXPERIENCE: (Saturday and Sunday) – Demonstrations & storytelling will reflect events concerning over 200 years ago exactly where you stand. Receive a genuine account of this hallowed ground’s legacy. (Saturday, Sunday and Monday) – Rail transportation author and enthusiast, Ken Springhirth’s, mission is to preserve the history of rail systems and educate the public on the importance of their contribution right here in Waterford and beyond. Saturday, October 15th GIANT PUMPKIN WEIGH-OFF: This global event has competitors hauling their mammoth fruits from far and wide vying for the world record weight. You have to see it to believe it. Saturday, October 22nd MASCOT DAY: Come and play with your favorite local mascots. Slap Erie Bayhawk a high-five then race Sea Wolf down the slides. Enjoy a collaborative, interactive meet-and-greet unlike anything in the area. Saturday, October 29th PUMPKIN-PALOOZA: Carving, smashing, launching, demolishing. Allow this scene of zany pumpkin antics to be a release of stress or creativity, the choice is up to you. 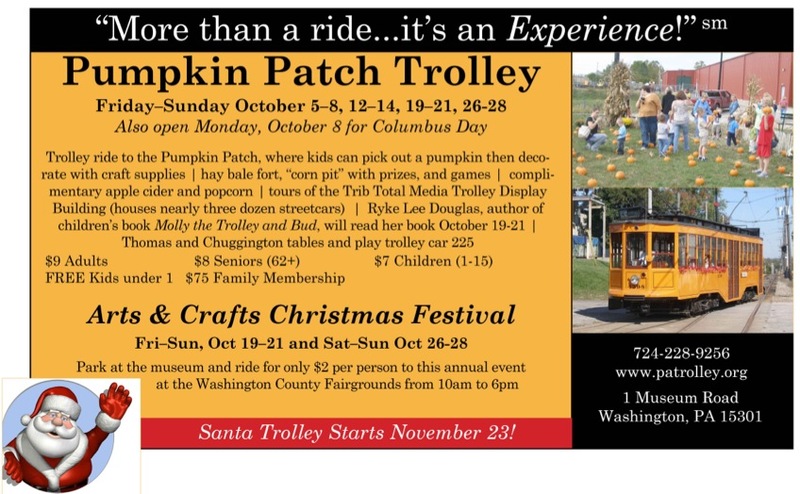 Gather the family and head on over to the Pennsylvania Trolley Museum for a ride on the trolley to the Pumpkin Patch. Children may choose a pumpkin and decorate it too while the parents explore more than 30 streetcars in the Trolley Display Building! And, enjoy a second ride on the harvest-themed shuttle trolley, complimentary popcorn, a bouncer, a bustling Lego city with multiple trains, and snap family photos in the harvest-themed photo area. Reilly’s is open every weekend for a Harvest Festival of Fun! Hayrides to the great pumpkin patch where you’ll find all sizes of pumpkins for your picking pleasure, Pumpkin Patch Hayrides, the New Boo Barn with added excitement, the Cornstalk maze, Marshmallow roast, Balloon Typhoon, Pedal Go Carts, Pony Rides & Petting Zoo, Face Painting, Cow Milking, Scarecrow-Making, Country Store, Wanda’s Games, Ducky Plucky, Carmel Apples, Refreshments. A one-price a super Harvest Festival ticket includes activities. No reservations needed, just come and have fun! We have play hay, and a corn stalk maze free of charge. For a few dollars we offer pony rides and hay rides around the pumpkin patch. Additional Fall Fest Activities open Mon-Fri 4p-7p, Sat 11a-5p, Sun 12p-5p including: Hayrides and Ponyrides $3, Giant Corn Maze $5, Toddler Cornbox $3 (cornbox open only on weekends). There is a wide selection of refreshments, including Hot dogs, snow cones, cotton candy, apple cider slush, and candy and caramel apples. Not to mention farm fresh steamed vegetables, and French Fries made our own potatoes. Stop by to pick your Halloween Pumpkin, buy bushel of apples, or just have a fun filled afternoon. We offer hayrides to our pumpkin patch and corn maze. It is a great way to spend an afternoon with your family, and it’s the perfect time to get your jack-o-lanterns, cornstalks, straw bales, decorative Indian corn–as well as our delicious sweet corn, apples, cider, and vegetables. Of course don’t forget to stop at the fudge counter! Over five acres of pumpkins, Free Apple sample and cup of cider, Hay maze and 3 acre corn maze and 1 acre corn maze, Nature challenge trail, 100ft slide and smaller Fire Truck slide!, farm animals. Weekend Extra Activities Include: Food Concessions, Pumpkin Carving Display, Pony Rides, Pumpkin Typhoon, Apple Sling Shot, Music by Fiddlin’ Mike and the Fiddlin’ Around Band, Apple Picking click here for details (weekend activity availability due to weather may vary call ahead). EAT: There will be a ton a great food every fall festival weekend including hot dogs, kettle corn, pie, apple cider, hot sandwiches, candy apples, caramel apples, funnel cake, ice cream and more! Hayride to Pumpkin Patch, Pick your perfect pumpkin, Pumpkin Land Characters, Corn Maze, Petting Zoo,…and MORE! Great food & fun for the entire family! Scenic Hayrides & 4-acre corn maze, fresh made apple cider, pick your own pumpkins and so much more. Learn more about activity, pricing, menu for Pittsburgh’s best fall festival. WEEKDAYS (beginning October 5th) 4PM-7PM (W-F). Hayrides, Pumpkinland hayride, Boo Barn, Rope Maze, Liberty Tube Slide, Squirrel Hill Tunnel Slide, Ducky Derby, Quack Shack, The Chick Inn, Goatfield Street Bridge, Barnyard Carnival, Farm Flinger, Barnyard Strikers, Corn Maze, Giant Inflated Obstacle Courses, Pony Rides. Don’t forget to PICK YOUR OWN Apples & Pumpkins to take home! We are starting pick your own apples Saturday SEPTEMBER 24TH FROM NOON TO 5PM We will have pick your own apples on Wednesdays 12PM-3PM through the end of October. We also are having hayrides and pick your own pumpkins. Hayrides are Saturdays from 12PM-5PM till the end of October. The maze this season is 20 amazing acres, 4 separate mazes in 2011, 18 checkpoints to locate! Play FSI and Farm Tracks. Straw Pyramids, Corn Box, Corn Hole, Wood Cut-outs for Photos, Swingset, Hayrides & Barrel Train rides (Saturdays & Sundays check prices), Concessions by G&G (sausage sandwiches, steak hoagies, corn dogs, great french fries, apple dumplings, lemon shakes, ice cream, popcorn, and more! This is not a haunted maze, but you are welcome to come after dark and bring your own flashlight, or you can purchase one for $3.00 when you arrive. Feed the animals in the petting zoo area. Goats, Alpacas, and Chickens. (Petting Zoo open all season) Mickey’s Homemade fresh apple & pumpkin pies-whole or by the piece. Pumpkins, straw bales, and corn stalk bundles for fall decorating for sale. Have you attended one of the events listed here? Please tell us about your experience in the comments section.